Get a head start on your engineering degree by spending a week on Olivet’s campus, earning college credit and connecting with other students who share your interests and passions. 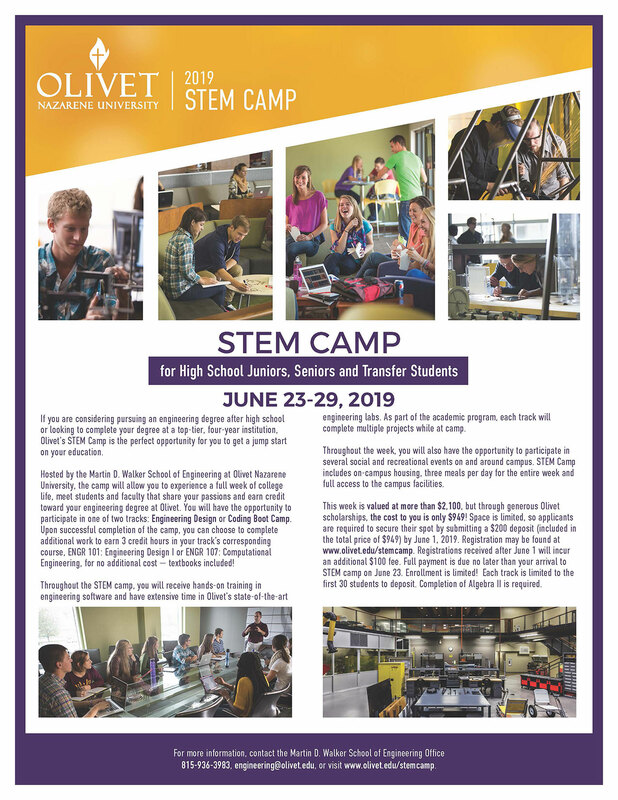 If you are considering pursuing an engineering degree after high school or looking to complete your degree at a top-tier, four-year institution, Olivet’s STEM Camp is the perfect opportunity for you to get a jump start on your education. Hosted by the Martin D. Walker School of Engineering at Olivet Nazarene University, the camp will allow you to experience a full week of college life, meet students and faculty that share your passions and earn credit toward your engineering degree at Olivet. You will have the opportunity to participate in one of two tracks: Engineering Design or Coding Boot Camp. Upon successful completion of the camp, you can choose to complete additional work to earn 3 credit hours in your track’s corresponding course, ENGR 101: Engineering Design I or ENGR 107: Computational Engineering, for no additional cost — textbooks included! Throughout the STEM camp, you will receive hands-on training in engineering software and have extensive time in Olivet’s state-of-the-art engineering labs. As part of the academic program, each track will complete multiple projects while at camp. Throughout the week, you will also have the opportunity to participate in several social and recreational events on and around campus. STEM Camp includes on-campus housing, three meals per day for the entire week and full access to the campus facilities. This week is valued at more than $2,100, but through generous Olivet scholarships, the cost to you is only $949! Space is limited, so applicants are required to secure their spot by submitting a $200 deposit (included in the total price of $949) by June 1, 2019. Registrations received after June 1 will incur an additional $100 fee. Full payment is due no later than your arrival to STEM camp on June 23. Enrollment is limited! Each track is limited to the first 30 students to deposit. Completion of Algebra II is required. Applications for the STEM Camp can be started or managed with our online system. Space is limited, so applicants are required to secure their spot by submitting a $200 deposit (included in the total price of $949) by June 1, 2019.